Gastrointestinal toxicity is often a complication of cancer and its treatment. 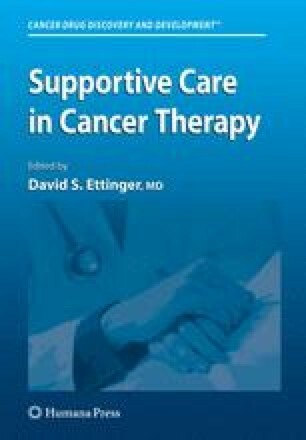 It is a common complaint of patients being treated with tumor-directed therapy and requires appropriate supportive care. Approximately 148,600 cases of colorectal cancer are diagnosed annually. The sequelae of disease progression and the toxicity of treatment can result in significant gastrointestinal complications. Inadequate assessment and treatment can lead to debilitating symptoms and significantly impact quality of life. This chapter will review two common complaints encountered in patients with gastrointestinal malignancies: diarrhea and constipation. Strategies will be discussed for effective palliation and treatment of these common conditions.